Mauritius is a unique destination which showcases an array of beautiful landscapes, stunning beaches, 5-star hotels, adventures and activities with a magical appeal and charming culture. It’s one of the most beautiful islands I have ever visited. Kite Surfing – Mauritius is the perfect place for kitesurfing; it offers the ideal environment and climate. Several clubs operate on the island, offering introductory courses for beginners, equipment rental, and training sessions. The kite surfing centres have recently formed an association and are organizing an annual kite festival in June/July. Port Louis – At the heart of the north west mountain range, Port Louis, the capital city of Mauritius, welcomes thousands of people every day. The Central Market is an extraordinary place, full of life and color; the Champ de Mars is the most ancient horse track in the Indian Ocean; and the Citadelle, a fort built on a hill, offers a beautiful view over the city. Ile aux Cerfs – One of the most visited spots of Mauritius, Ile aux Cerfs is a beautiful, large beach, surrounded by the lagoon. Scuba Diving – Mauritius has earned a good reputation among the world scuba diving destinations, given its transparent waters, the lovely temperature all year round, and its rich underwater life, all combined to provide a great experience. About 70 dive centers offer training and certificates that are accepted worldwide. Curious Corner of Chamarel – Curious Corner is all about exploring that grey area of life, where things are not what they seem, and having fun in the process. Experiences include an upside down room and The Laser Music Room that allows you to experiment with the marriage of light and sound. 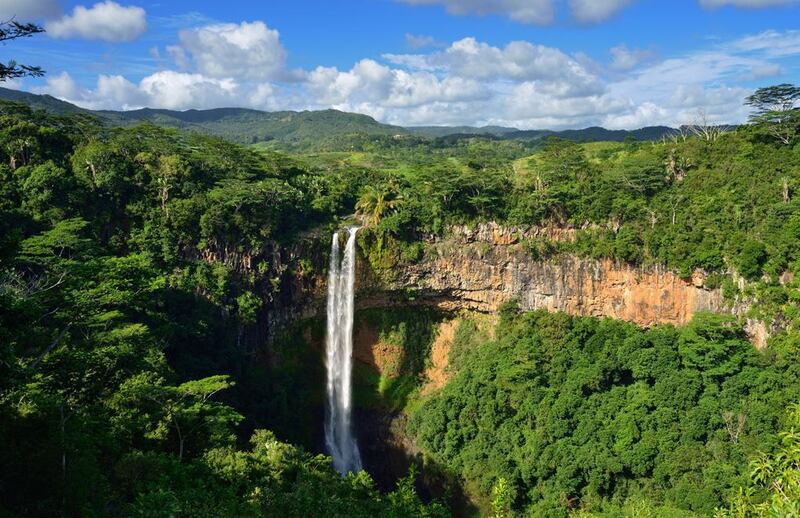 La Vanille Reserve – The “Vanille Réserve des Mascareignes” nature park is located in the South of Mauritius. At the park, you can stroll in the middle of a lush vegetation and natural environment. They have the largest number of tortoises reared in the world including 1000 tortoises, 2000 crocodiles, 23 000 butterfly and insects species, monkeys, iguanas, and deer. Children can pet and ride giant tortoises and hold baby crocodiles. How cool is that? Blue Safari Submarine – The fleet of Blue Safari Submarine consists of two submarines. Each of the two submarines can dive to more than 35 meters of depth. You can also pilot your own underwater subscooter by 3 metres of depth. Casela – Casela is 14 hectares of lush green which is now home to a big variety of fauna and flora. Some 1,500 birds, a selection of wildcats, zebras, giant tortoises, long-tailed monkeys, among other species, can be watched on site. Casela World of Adventures includes canyoning or hiking, double and triple ziplines, and adventurous cable bridges. What a great way to discover and unwind amidst nature’s best! You can also find yourself face-to-face with zebras, ostriches, deer, African antelopes and all their neighbours during the Photo Safari Tour or experience the excitement of riding quads on a rugged plateau and come across zebras, ostriches and African antelopes in their natural environment. Easterlies Cruise – One of the most memorable days in Mauritius is relaxing on the ocean, snorkeling, and exploring the coastline. Easterlies Cruises sail on both the east and the west coast of Mauritius. Tourist Visa – This visa is valid for a maximum of 6 months. Upon arrival at the airport, the visitor is given a first tourist visa for 3 months, which is renewable for a further 3 months upon application. The eligibility requirements include: (A) Passport valid until the day after departure. (B) The return ticket with the date of return to the country of origin. (C) Confirmation of accommodations – hotel booking or a letter from the bungalow manager or proof of sponsoring by a Mauritian citizen mentioning their contact details. Money Matters – International banks in Mauritius: HSBC, Barclays Bank, South East Asian Bank, Indian Ocean International Bank, Deutsch Bank. Bank counters are pen during arrivals and departures of international flights at Sir Seewoosagur Ramgoolam International Airport. Banks as well as most hotels, restaurants, and shops in commercial centers accept credit cards. Driving – Driving is on the left side of the road and priority is given to vehicles coming from the right. Visitors holding a legal driving license from the competent authorities in their respective countries can drive in Mauritius. Transport – Public transport is available through bus companies throughout the country. Express bus services are offered from Port Louis towards the north, the south, and the main towns. Taxis are available at the airport and from the hotels. To rent a car, it is recommended to contact recognized and licensed operators. Heath and Safety – Medical services are free in Mauritius in many hospitals and regional public health centers. Private clinics offer chargeable care. A tourism police unit has been set up to reinforce security in the more touristic areas. This island is now on my bucket list. I didn’t know it existed but it’s in the top five now!